The LVCN-140 series has been discontinued. Please contact our Flow Engineering department. The LVCN-140 single sensor controller provides a high or low sensor alarm function with a single sensor input. With a range of dampening adjustments, this controller can compensate for relay chatter. 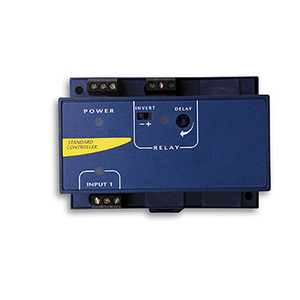 It conveniently mounts to a standard EN50 022 DIN rail and utilizes a 10 amp relay. All functions are fully enunciated with LED lights. Selectable relay state of normally open or normally closed are another feature.